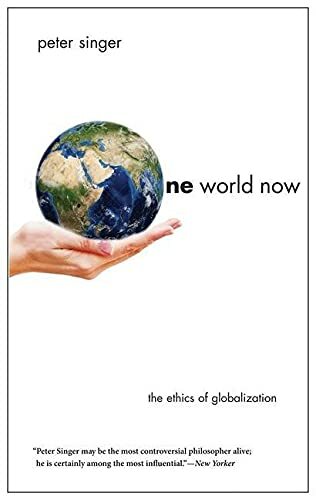 In One World Now: The Ethics of Globalization, Peter Singer, an Australian moral philosopher, discusses humanity's shared ethical responsibility and sovereignty. We live in a global world that—unlike the older term "internationalization" conveys—emphasizes that we are moving; that is, "moving beyond the era of growing ties between states," he says. Within his text, Singer addresses a central question: is the nation state loosing sovereignty? Perhaps. Should it? Yes, according to Singer. And he makes a strong case for overcoming it. Whether or not the nation state is losing its sovereignty is a difficult question to answer. On the one side, there is a growing nationalism, not only in the United States where president Trump claims that "America is for Americans only" (regardless of who the term "Americans" refers to), but in other countries as well. In Europe, for example, the Catalan fight for independence in Spain is fueled by nationalism combined with a strong desire to have an influence on the monetary resources of the region. Countries such as France, Austria, and the Netherlands are also flirting with nationalistic principles—perhaps it's a universal trend, other countries could be added to the list. On the other side, in spite of this expanding sentiment, there is also a growing countermovement, perhaps the most imminent in the U.S. This countermovement would probably have a lot of sympathy for Singer's project. In One World, Singer looks closely at the relationship between states and the world through different lenses, including atmospheric, economic, legal, and communal perspectives. For instance, he observes that an organization such as the World Trade Organization could minimize a state's power and sovereign control. In other words, state sovereignty can be reduced (and accepted by most) through reasonable global organs. In addition, Singer advocates for a universal law when it comes to crime and terror. Most importantly, however, Singer speaks about how people and nations will have to abdicate their sovereignty when it comes to environmental concerns. Singer's thesis is based on the fact that we live in one world. The phrase "one world" stands "as a description of the increasing interconnectedness of life on this planet and as a prescription of what the basic unit for our ethical thinking should be." His logic, therefore, is that one world needs one world government that can overcome each nation's self-interest and that "we need a sound global system of criminal justice." I agree completely with the fact that everything is interconnected, whereas I am not completely convinced that a world government is the solution to overcome our current problems. For those who are familiar with Singer's philosophy, it becomes clear that his ethical advice is based on the principles of utilitarianism. This theory requires that we all act in a way that maximizes the happiness of all human beings (who are all sentient creatures). He stresses the importance of this by referring to an UN report that says, "In the global village, someone else's poverty very soon becomes one's own problem: of lack of markets for one's products, illegal immigration, pollution, contagious disease, insecurity, fanaticism, terrorism." This quote illustrates the strength of Singer. He refers to many different—I am tempted to say "universal"—sources in order to make his argument stronger. Singer's utilitarian approach in One World is founded on both political and economic theories (though perhaps more so on the former). He aims for democratic solutions, emphasizing that, once we realize we are in this together, the more we will willingly share and uphold common values. This assumption is true. Still, it seems like the author of One World believes that many people do not understand our fundamental interconnectedness. I agree with him again. This lack of understanding our interconnectedness is one of the hurdles that Singer tries to overcome, for example, with the aforementioned UN report quote. However, if the UN report quote is read critical, it may teeters on the delicate balance between altruism and egoism. Utilizing the motivation of the latter may seem cruel, but the bottom-line of utilitarianism is that "I" should care for the happiness of all, because their unhappiness affects "me." Hereby a classical dilemma is touched upon—one that also exists in corporate social responsibility; for example, if a company acts morally due to monetary self-interest, is it then truly good? A utilitarian would regard such a situation based on the consequences, not the motive of the decision-makers. Thus, despite my appreciation of the good intentions of Singer's humanistic philosophy, I long for a deeper, existential understanding of the human being who, not only is morally responsible for the well-being of others, but is also responsible to pursue personal freedom and happiness. For example, Simone de Beauvoir argued that ethical freedom comes from resisting what represses one's freedom. In theory it could be global institutions. Similar to Beauvoir, Simone Weil addressed the problems with universal right and laws that are—at times— contrary to one's personal obligations. For example, when universal norms and ideals carry the inherent risk that each one of us may lose contact with one another. Or, we might forget or ignore that what is happening is also our own responsibility, not just the decision-makers. Let me reframe my concern in another way. Twenty years ago, Michael Jackson wrote a beautiful song to benefit the starving people of Africa, titled We Are the World. Today we can still sing along. Not much has changed. This paradox is perfectly illustrated in the life of Bill Gates, who generously donates many of his millions, yet, at the same time, grows wealthier and wealthier. Living morally by donating money becomes another kind of investment; the show goes on and on and on. We need to change the way we think. Singer is probably right to spend so much time in One World convincing his readers that everything is interconnected. However, even after reading Singer's book, we are left with ethical dilemmas. Let me be even clearer. According to Gilles Deleuze, our style of thinking is related to our ethic—how we affirm certain things as we encounter them. But since no ethical issue can have privilege over another (for example, human starvation in Africa versus human suffering caused by an earthquake in Afghanistan), we have to cultivate our awareness of what takes place, how and why it takes places. What we affirm—according to Deleuze—are the differences between ethical issues, we explore and test; rather than counting "heads" to see which intervention will make the most people happy. Relying on a principle minimizes our capacity to think and to be affected by an ethical issue. For example, does our intervention depend on whether the problem is humanly manufactured, a natural disaster, or caused by political or financial factors, etc.? Utilitarianism may help us make decisions, but predicting an outcome is often difficult. For example, who would had known that the car today is not just a mean of transportation, but also a place where individuals can be alone and listen to music or an audio book? In other words, the car is for many a stress free zone, and, as most of us know, stress cost the society a lot of money. Furthermore, car users may pollute the environment (bad for all of us), but they may also be able to get home faster to their children (good for the family, but also good for the caring investment in future citizens, that is, the society). In continuation, a person who donates 2 euros out of every 10 he or she earns is not morally better than another individual who donates only 1 euro or none at all. The issue is not related to redistribution, but to the idea of ownership, the economy, and economical freedom, which actually touch on Singer's foundational belief that everything is interconnected, but from a different angle. The reason why some people have much give financially is because there is an imbalance to begin with. In other words, the ethical problem sticks deeper. This principle can also be viewed through the lens of Aristotle's distinction between moral excellence and strength of will. I believe that monetary donation may display strength of will, but moral excellence can be seen in the one who never asks for more than what is necessary. I am skeptical, yet positive towards Singer. I do recommend his book for decision-makers, but also for students of philosophy, political science, and business administration. One World is a wonderful resource to instigate constructive debates, and it is full of ideas of how to enact social change. Despite my reservations, the book's mantra, that we—all of us—are in this together, is a message that I believe is worth sharing.